Seasonal grilled vegetables on a wheat bun with a spinach and roasted garlic yogurt spread. Wrap garlic in foil and add 1 tablespoon of oil. Close tightly and place on grill. Cook for 15 minutes. In a large bowl, combine remaining oil, vegetables and spices. Grill vegetables until soft, about 3-5 minutes per side. Set aside. Meanwhile, in a large bowl, microwave spinach and water for 30 seconds. Drain water and squeeze spinach dry. Remove skin from garlic cloves. In a blender, puree with spinach and yogurt to desired consistency. Season with salt and pepper, to taste. Grill buns for 30 seconds per side, or until browned. 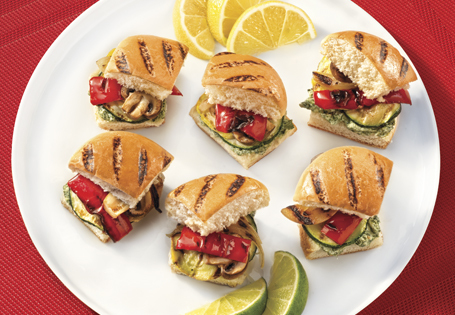 Spread spinach garlic spread on bun and top with grilled vegetables. Cut into quarters and serve immediately.